HOMESTEAD, Fla.—Austin Dillon withstood a strong challenge from race winner Johnny Sauter to win the NASCAR Camping World Truck Series championship in Friday night’s Ford 200 at Homestead-Miami Speedway. 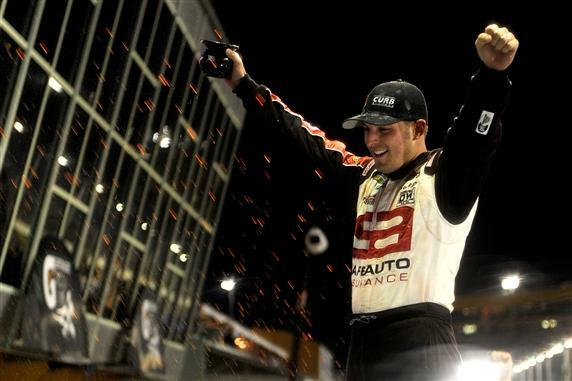 NASCAR called the event with 15 laps left with Sauter in the lead and Dillon in 10th place, giving Dillon, 21, the youngest champion in series history, a six-point edge over Sauter in the final series standings. Dillon is the first driver in series history to win the rookie of the year title in his first full season and the series championship the following year. "I remember my first championship with Dale Earnhardt," said team owner Richard Childress, Dillon’s grandfather. "I had the same feeling tonight watching my grandson." "You can’t go out of the truck series any better than this," said Dillon, who will graduate to the Nationwide Series with RCR next year. Denny Hamlin finished second in the No. 18 Kyle Busch Motorsports truck, followed by Kevin Harvick, Nelson Piquet Jr. and Joey Coulter, who won the 2011 rookie of the year title. Coulter is a teammate of Dillon’s at Richard Childress Racing. As the race progressed, so did Dillon, who had worked his way into the second position behind Sauter before Ross Chastain’s spin on Lap 96 caused the fourth caution of the evening. The subsequent restart, however, brought more stress than Dillon ever could have expected. Dillon fell back to 15th, fearing that he might have a problem with the right front fender on the No. 3 Chevrolet. Shortly thereafter, Sauter clinched most laps led, putting Dillon in danger of losing the championship if he lost more positions by the end of the race. "The fender got bent in—I don’t know how it happened," Dillon said. "I didn’t hit anybody on the track, but I think it happened on pit road. We got real tight once I got back there (in traffic). I think it was more on the conservative side when I was three-wide. We were three-wide in the middle, and to force a spot right there was not worth it." Sauter, who won his second race of the season and the fourth of his career, wasn’t aware of how far behind Dillon had fallen on the restart. "I had no clue," said Sauter, who won more than one event in a season in a top NASCAR touring series for the first time in his career. "Not one time tonight did they tell me where the 3 truck was. It didn’t really matter where he was running. We knew what we had to do, and that was lead the most laps and win the race. "It’s a huge accomplishment, coming out here and doing what we needed to do. Six points is a bummer. You can think back on the season—dominating Kentucky, broke an axle, 20 to go, leading the race; ORP (Indianapolis), leading the race, flat tire; the lane violation at Texas, 22 points; six points at Pocono. You can go down the list—but everybody can. That’s just racing." Notes: Greg Biffle and Travis Kvapil won rookie of the year honors and truck series championships, but not in consecutive years. Biffle accomplished the feat in 1998 (rookie) and 2000. Kvapil was rookie of the year in 2001 and champion in 2003. … Harvick had clinched the owners’ championship with his No. 2 truck before the series arrived at Homestead.